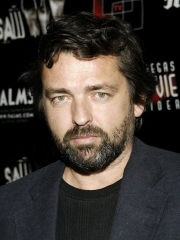 Angus Macfadyen is a Scottish actor. Angus Macfadyen was born in Glasgow and was brought up partly in Africa, France, the Philippines and Singapore. His father was a doctor in the World Health Organisation. He was once engaged to actress Catherine Zeta-Jones. Angus attended the University of Edinburgh, and the Central School of Speech and Drama in London. He has portrayed Orson Welles in Tim Robbins' 1999 film, Cradle Will Rock, Philip in the BBC's production of The Lost Language of Cranes, Dupont in Equilibrium, Robert the Bruce in 1995's Braveheart, and Jeff Denlon in the Saw film series. Whole or part of the information contained in this card come from the Wikipedia article "Angus Macfadyen", licensed under CC-BY-SA full list of contributors here.